My WTF experience this year revolved around some new terminology and techniques. I learned there are now “environmental arborists” who practice “retrenchment pruning.” In the last few days I’ve tried mightily to find some standard definitions from reputable sources. I don’t know what an environmental arborist is, since it’s not a certification (like an ISA certified arborist) nor is it a university degree program (like urban forestry or environmental horticulture). It seems to be a self-anointed title. This is what a mature urban oak should look like. But the real WTF issue is retrenchment pruning. I looked in vain for published research through my usual data bases and found nothing – other than two articles in Arboricultural Journal (which is not the same as ISA’s journal – Arboriculture and Urban Forestry). Neither of the articles presented experimental evidence to justify this radical approach to pruning trees. Instead, they are more philosophical in nature, with a smattering of ecological theory. Fortunately, retrenchment pruning methods are easily found on the internet, along with horrific pictures illustrating the results. As described on various websites, retrenchment pruning imitates the natural process of aging. Practitioners remove live branches or partial trunks to reduce the size of the tree and prevent future failure. These aren’t clean cuts, either: they’re “coronet cuts” or “natural fractures.” The rationale described in one of the Arboricultural Journal articles is that these jagged broken branches and trunks “promote specialist habitats and enhance colonisation rates of niche species.” In other words, this technique creates large wounds that are easily colonized by various insects and microbes. So apparently we’re expected to ignore the well-established field of woody plant physiology (which happens to be my specialty) and related practical bodies of knowledge (e.g., formal and informal pruning techniques of said woody plants) and start hacking away at mature trees. In doing so, we’re removing live tissue and creating large wounds. This has the effect of both reducing photosynthetic potential of the tree as well as opening it up to possible pest or disease invasion. But nowhere are these possibilities discussed as part of the “natural aging process.” Nor was there mention about how to manage the epicormics shoots that result from improper pruning. And they do need to be managed. 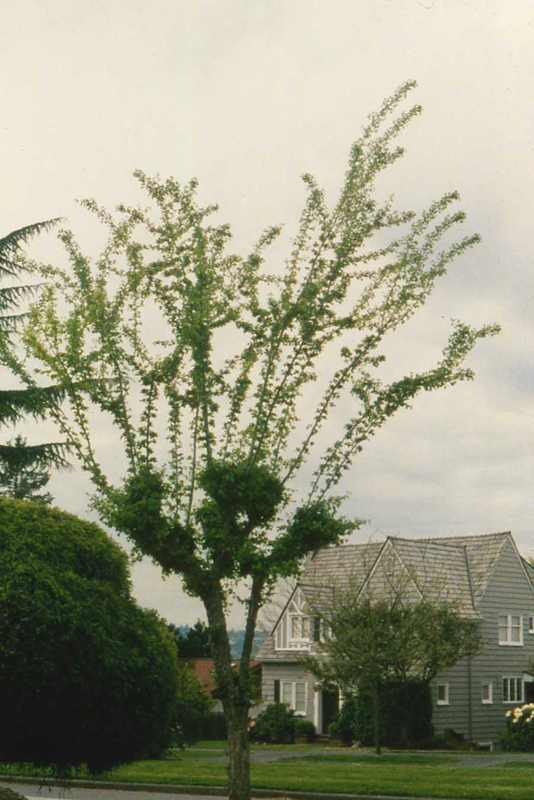 These are epicormic shoots resulting from topping this tree. Laurie, please post the citation to your research here so we can all read it. I was frustrated during my literature search by the lack of published evidence and would love to see yours. Retrenchment pruning and crown reduction in general does NOT involve extra wounding that is not specified. It’s all in the objective.Where increasing habitat for saproxylic insects is the objective, extra wounding such as coronet cutting is specified. See slides 10-11 of this excellent presentation, as presented to the European Parliament. If the overriding objectives are tree structure and health, cuts would instead be kept small, and more dynamic mass conserved. btw, Conservation Arboriculture is the term some use; I’ve never heard “Environmental Arboriculture” used. I hope you take the time to reexamine some of the mythical beliefs about pruning in the US. Shigo would be spinning in his grave if he saw the tree mutilation done in the name of “Shigo/collar cuts”! O and…how can we get the US Congress to take the time to hear about trees and their care? Guy, please provide links or citations to peer reviewed work on this practice. I can’t find any, and as a woody plant physiologist I need to see published studies comparing conventionally managed trees to those subjected to retrenchment pruning. Ancient and other veteran trees: further guidance on management. (ISBN: 978-0-904853-09-4) David Lonsdale (Publisher of the Principles of Tree Hazard Assessment and Management which i am sure you are aware of). Also; Veteran Trees – A guide to good management (ISBN 1 85716 474 1) a published book by English Nature in conjuntion with The Forestry Commision. Retrentrchment pruning mimmicks the natural cylce of a a tree in late maturity, of course it very rarely has its place in an urban environment but occasionally it does providing the risk of failure has been assessed. Normally most arborists are far too heavy handed though and crown reductions should be kept to a minimum and done in a phased fashion. Coronet cuts are not done for the trees benefits but for the saproxylic invertebrates that are only found in niche environments. Anyway some very useful infomation in the above reccomendations. I admit I’ve not seen either of these books, because I focus on peer-reviewed information. I’m a little concerned about the applicability of Dr. Lonsdale’s peer-reviewed research (the sources you mention are not). For those that don’t know, Dr. Lonsdale is a tree pathologist. He is an expert on wood-decay fungi and his primary interest is “deadwoodology”. I agree that woody debris is vitally important to landscapes, managed or otherwise. What concerns me is that he promotes inoculating standing trees with decay fungi to increase woody debris production (see below for an except). 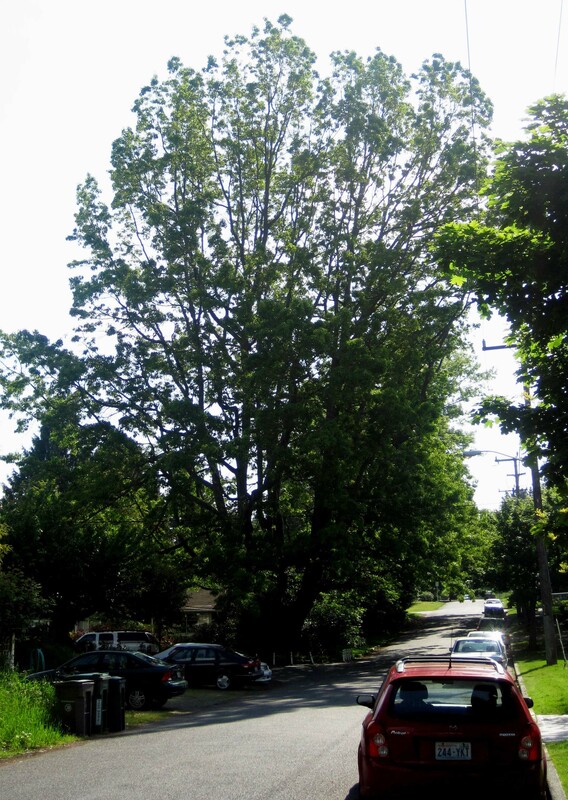 While this may be desirable in a woodlot, it is probably not what homeowners want, or those who manage public greenspaces with standing trees. In my opinion, a book on managing aging trees should be a peer-reviewed resource with an emphasis on optimizing tree health. There’s probably some middle ground here, but right now the enthusiasm for the practice appears to outweigh the necessary verification by independent woody plant physiologists. “These include restricting salvage operations in windthrow stands, actively encouraging the accumulation of deadwood in forests, and facilitating decay in standing trees by inoculating them with fungi.” (from Lonsdale, David. 2008. Wood-decaying fungi in the forest: conservation needs and management options [electronic resource]. European journal of forest research, Vol.127(1), p.1-22. Still waiting for a reply on the Grabosky/Gilman work. And the other peer-reviewed work on reduction pruning by those two and also Follett, Rieland, Goodfellow, etc. These continued references to popular but unproven theories about reduction pruning as ‘conventional’ and traditional’ does not confer credibility. Specified reduction with small cuts is a proven practice, unrelated to unspecified reduction with large, often internodal cuts is night-and-day different.. You can’t discredit the first by lumping it together with the second, or with intentional wounding like coronet cuts, or with intentional infecting. Those are red herrings. Specified reduction spurs interior growth that is easily managed. closed. One of the six large sprouts were removed, and two subordinated. The less dominant leaders were slower to close their wounds. done in 2009 showed no decay spread past the two new terminal branches. often resulting in reiteration and rejuvenation. You will have to wait until this summer at the ISA meeting where I will be reviewing the peer-reviewed science behind managing mature trees. Linda sounds like you’re approaching it with a pre-conceived bias. No, this is how one approaches science – with a scientific question. My question was “Is there scientific evidence to support retrenchment pruning?” The answer was no. Plenty of ongoing research being conducted successfully at the Davey Research Farm in Shaylersville, OH. That it hasn’t all been published yet does not change the fact that the preliminary findings are proving the viability of this methodology. There is definitely a right and many wrong ways to approach retrenchment pruning. As overextended oaks continue to break due to overextended lever arms, shall we wait for all the peer reviews or do what we know works? Research, unfortunately, too often moves at the speed of traffic in LA. You and Guy have been saying this same thing for a couple of years now. And I’ll repeat – until published, information is just anecdotal, regardless of who is providing it. Moreover, a Google search of “Davey Research Farm” and “retrenchment” had zero results. As yet, there is no “right” way to do retrenchment pruning because there is no reliable science to guide it. Young tree responses to pruning are both researched and well understood from a plant physiology perspective: in other words, it’s easier to predict what’s going to happen because there is a robust body of literature to draw on for predicting responses. Mature tree responses to pruning are different, because their resource allotment is different, their morphology is different, their physiology is different…and so on. The literature that does exist on the physiology of senior trees does NOT support retrenchment pruning – so we can hardly jump on the retrenchment bandwagon solely on the basis of anecdotal evidence. If and when there is something experimental in the peer-reviewed literature that specificallt pertains to retrenchment pruning of mature trees, we can certainly discuss it. But even now – nearly three years after I posted this – there’s still nothing. I gave a talk on the science behind mature tree responses to pruning at the 2016 ISA meeting and other venues since then: bottom line, our current understanding of mature tree physiology does not support retrenchment pruning. Left a quick (still wordy) comment on the Garden Professors. Looks like this was Alexander Laver’s stuff over in the UK. Guy Meilleur’s historic tree work is somewhat more scientifically based. But he did reference the Laver’s talk on his blog at Historic Tree Care. Being an instructor in arboriculture myself (through AL extension) I still don’t advocate for the retention of really old trees except in specific situations. Risk management and realities of lifespan really should take precedence in my opinion. It was Laver’s work (who doesn’t appear to have published anything in the scientific literature). Nor can I find any experimental work published by Guy. Granted, I’ve only been searching for a few days but the fact I’ve come up with nothing in the mainstream plant science literature is alarming. Linda, as a woody plant physiologist I need to see published studies that compare standard crown reduction on mature trees to those subjected to the butchery that is sometimes called “conventional management.” or CM. As trees grow large, they no longer fit around urban infrastructure. Roots and branches are often harshly reduced to make room for human activities. Retrenchment pruning is a phased form of crown reduction that retains biomechanical integrity by shedding small branches and developing a lower crown. International pruning standards agree, with some variation, that specifying this work can meet the objective of sustaining the substantial benefits from older trees. Systematic specifications for retrenching the branches and roots of trees with hollows and other perceived hazards have maintained reasonable costs and risks on trees around the world. Let’s not change the subject. I’d like to see published, peer-reviewed, experimental studies supporting this practice. Are there any? If the subject is published, peer-reviewed, experimental studies supporting ANY *mature* tree pruning practice, it seems like a rather empty subject. Are there any? The lack should not be alarming to anyone familiar with the myriad variables involved in the responses of mature trees. Alexander’s from the UK, where we met in 2012. A good chap, one of many dozens I reference. Coronet (little crown) cutting is a fad in countries with crowned heads of state. I’m not now and have never been a coronet cutter, but I’ve never been assigned to create habitat for stag beetles, either. It’s not uncommon in Sweden; never seen it hurt or help a tree significantly so I wonder what’s the fuss?
. Also in the US we are not familiar with the anatomy and physiology of Q. robur, the dominant oak species over there. So our views of Q robur management are limited. Regenerative/Retrenchment pruning is a separate subject. It’s established in other countries’ standards and successful use in managing risk and extending tree lifespans. The A300 corporate standard embraces commonly repeated principles, despite the lack of published, peer-reviewed, experimental studies supporting any self-anointed ‘conventional’ tree pruning practices. So I guess the answer is no. There are no studies on mature trees comparing retrenchment pruning to research-supported methods. The “fuss” is that there is no regard for the points I brought up. Removal of live tissues reduces photosynthetic ability and imposes a stress on trees whose vigor may already be reduced with age. “Natural fracture” pruning opens up wounds to be colonized by insects and disease. Epicormic shoot growth will require management (and the cynical part of me suggests this ensures continued business). These are the types of concerns that woody plant physiologists have with the practice. Where is the evidence that regenerative/retrenchment pruning is “successful in extending tree lifespans?” Such a statement *requires* published experimental evidence. Otherwise, it’s just an opinion. I should also mention that in my first search in the CABI database for (pruning) AND (mature) AND (tree*) I got 812 hits. So yes, there is quite of bit of published research on pruning mature trees. Of those 812 hits, how many studies are done on mature trees? I’d like to know of any research-verified, not just ‘-supported’ methods. “Suggestions” don’t really count do they? Please cite research verifying that the removal of live tissues reduces photosynthetic ability. Where is your proof that other leaves do not photosynthesize more when they are exposed to more light? Several studies indicate the opposite. Please cite research proving that trees’ whose vigor is reduced with age. Research by Sillett et al document high vigor, showing this assumption is not always true. “Natural fracture” pruning is a separate subject from retrenchment pruning. So far with paper-citing, the score is 2 to 0. Reading Grabosky/Gilman first would obviate any concerns that academics with less experience might have about reduction pruning. It might also resolve the confusion about the rare practice of coronet cuts. The evidence that regenerative/retrenchment pruning is “successful in extending tree lifespans” is in the standing, thriving trees that were once condemned by misinformed assessors who said they could not be managed by ‘conventionable pruning’ criteria. Such a statement *requires* published experimental evidence. Otherwise, it’s just a bad opinion. You’ll have to wait, as I obviously have had no time to go through a literature search I just performed. Linda, it takes very little time to look at the Grabosky/Gilman papers to see very strong evidence that reduction pruning works to retrench and regenerate trees.. Nothing spurious about the positive correlation. There was no other way to manage the trees, in spite of underinformed condemnations based on ‘conventional’ misinformation. Pruning alone occurred prior to regeneration. No other potential causes present themselves. Can any mature tree pruning efficacy be proven by GP criteria, given all the variables? Intentional wounding provokes serious concerns, and is not commonly done during crown reduction. At one time it was theorised that more surface area of cambium would mean more regrowth, but that has not panned out. There were varying levels of agreement about crown retrenchment, some fine points were discussed, but no overt diagreement. Anyone angered or incensed would have stood out in the crowd! Please invite anyone to submit questions about any issues; most are easily resolved. These are some of the unproved assumptions that practical woody plant physiologists do not understand. References please?. Let’s start with these quotes, which are all from Drs. Harris, Clark and Matheny Arboriculture (4th edition). If you are not familiar with this edition of the book, you’ll be relieved to know that it cites primary literature. I’m sure you have the book and can look these up yourself. 1) There is a section (pages 360-369) on pruning mature trees. It is full of recommendations, based on published studies, on how to prune mature trees. It does state, however, that “Heading, unfortunately, is often used by well-intentioned but ill-informed people to reduce tree size…Regrowth from below the cuts is dense, vigorous, and upright.” It goes on to explain why this is a problem – which is point #3 below. 2) This one seems fairly obvious to me – if you remove leaves you have less photosynthetic area. And sure, you’ll get new leaves forming, but “Even with more and larger leaves on longer individual shoots, there are fewer shoots with less total leaf area and fewer buds” (p. 337). You will need to provide some pretty substantial evidence to discount this body of knowledge. So if an article or book cites primary literature, that mean that all of the opinions expressed are “scientific knowledge”? Cool–that is so easy! btw one Harris co-author is not a PhD; not that that matters. She’s a good writer, but not a pruning expert. “Heading” has several definitions. It’s an antiquated trade term; the above reference is unclear. I already cited Grabosky/Gilman (2009) which was controlled experimentation on reduction cuts that showed a gradual and sustainable tree response. Proper regenerative pruning does NOT involve “large heading cuts”. Your first blog post confused intentional wounding for wildlife with regenerative pruning. That got sorted, but now it’s being mixed up with topping. Perhaps by reading the primary literature, you can stay on the topic. This quote was NOT in the mature tree section. Big cuts on baby trees are off topic. The question was: Does total leaf area = photosynthetic capacity? Factors like sunlight, chlorophyll, structures within the leaf, seem to play a part as well. It’s not that simple. “Heading” young leaders is not the topic–we are talking about mature trees! Again the unscientific term confuses specified reduction with topping. The book you reference has many alternatives to topping/lopping/heading cuts: reduction cuts “will retain a tree’s characteristic form, minimize the problems of decay and regrowth, let more light in to retain interior foliage…” p 364. Don’t like Harris et al.? I like that book more than any other book on tree care. But every recommendation is not Fact, and the parts about *mature* tree care are relevant to the topic of retrenchment pruning. Maybe you like Dr. Lee Reich’s information (The Pruning Book) better. Just because “Dr.” is before someone’s name, they can still overextrapolate, and overstate! Statements about growing young trees do not inform the objective of conserving mature trees. Pﬁsterer, J. 1999. Geholzschnitt nach den Gesetzen der Natur (Tree pruning according to the laws of nature). Stuttgart, Germany: Verlag Eugen Ulmer. Read, Helen. Veteran trees: A guide to good management Peterborough : English Nature, 2000. Shigo, Alex. A New Tree Biology. Shigo & Trees Assoc., 1991. You will need to provide some pretty substantial evidence to discount this body of knowledge. But at a minimum please skim Grabosky/Gilman to clear up that misconception. Guy, many of your references are not peer-reviewed. I’m not sure you know what the term means. Peer-reviewed is (ideally) a double-blind method of reviewing manuscripts, including books. Popular articles don’t meet this standard. As I’ve said before, there is NO published, experimental, peer-reviewed literature on the topic of retrenchment pruning. I’m not going to denigrate your lifelong experience in arboriculture. But the consensus among PhD woody plant physiologists that I know (all of whom have academic credentials and many of whom are practicing arborists) is that retrenchment pruning as described by popular literature and websites is not a science-supported method of managing mature trees. Your suppositions regarding photosynthetic capability and plant responses to pruning do not agree with the body of knowledge that constitutes woody plant physiology. Basic college textbooks on whole plant physiology can explain this. Linda, please refer to Gilman/Grabosky’s 2 papers cited earlier, and the Goodfellow (2009) as well, before changing the subject. As I’ve said before, there is more published, and nearly published, experimental, peer-reviewed literature on the topic of “specified reduction pruning to stimulate an inner crown” which is the primary act in the retrenchment/regeneration process. Their *data* support the economic and biologically effective practice of specified reduction pruning on mature tree crowns and branches. Interior growth on 2 oak species was much stronger than growth near the cuts. The pruning helped the trees ‘grow downward’, aka retrench, aka regenerate. This practice has nothing to do with topping young trees, or internodal cuts of any kind. It has nothing to do with torn cuts. Wound size is typically limited to <4", unlike the commonly promulgated criteria and standards. "Reconfiguring" is how the ISA BMP describes proper crown reduction to stimulate an inner crown. That was reviewed by 80+ peers; does it not count? Is there another definition? Many of my references were indeed peer-reviewed, if that includes a single-blind method of the author not knowing the reviewer during review (usually we chat after though). They all cite the kind of references and studies and primary research like the Grabosky/Gilman work. *Please address that data* before citing chat with a few PhD buddies as 'consensus'. I was at the same conference for four days and none of my BCMA, ETT etc. buddies were 'incensed' about anything. My informal study shows that academic credentials imply little scholarly inquiry. Dr. Gilman was notable in engaging the material. The rest of your in crowd failed to express why they were 'very angry', or anything at all, when seeing a poster with that title. During hours of contact with peers, there never was heard a discouraging word. But I don't fool myself into thinking that's a consensus; many are unfamiliar with the practice and are still working out what it means. They must be looking at a very narrow and denigrating list of popular literature and websites. Your picture of the little topped tree was just like the images of torn-up cuts have nothing to do with "reduction pruning to stimulate an inner crown"; irrelevant, inflammatory, misleading, will incite to get such misconceptions. If they define 'retrenchment' with coronet cuts, they are changing, or at least missing, the subject. It's important to focus on the Data. Discussion is connected, Conclusions are less connected, and cocktail gossip is just that. 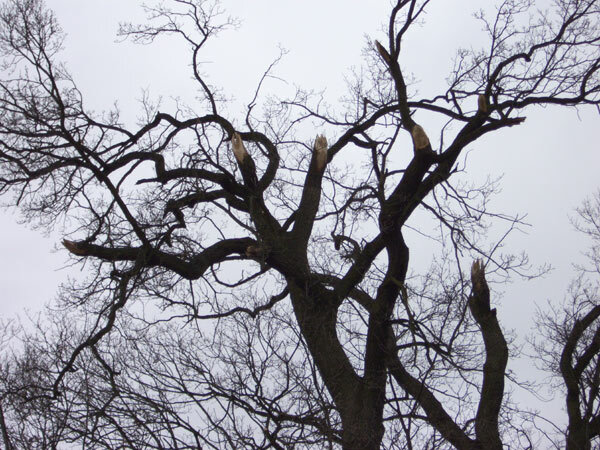 Consensus is the watchword of the A300 Tree Care Standard, and the ISA BMP, which both describe proper reduction pruning and specified cuts that many might call by the uncertain term 'heading'. It's not perfect, but it's a more verifiable form of consensus. They welcome comments from woody plant physiologists of all backgrounds. But first it's key to get clear on the terms, and *address the data* establishing long-term benefits from reduction pruning of older trees to stimulate an inner crown. So if you can agree that those two “myths” are not myths at all, we can move back to the discussion about methods of pruning mature trees. Otherwise, I’m done responding to an ever changing list of stuff. Good Lord Linda your pre-conceived bias is dripping from your comments. Both Guy and I are BCMA’s with combined arboricultural experience of nearly 100 years. Retrenchment pruning is a well accepted topic in the arboricultual community. There is ongoing research at the Davey research plot in Ohio. Experienced, tenured arborists have seen it work. Guy in particular is very deliberate in advocating for small diameter cuts back to nodes or side branches. We are waiting for the not so well funded research to catch up. So, would you have us simply cut down historic trees, or perhaps just fall apart and kill people? Wow. So many assumptions and inaccuracies. Let’s see. 1) As I mentioned earlier, the way science works is to approach a topic with a question or hypothesis. Before I did this literature review, I’d never seen the words “retrenchment pruning” in a peer-reviewed, scientific article. I still haven’t. So no bias – just a complete lack of experimental evidence (or even theoretical evidence) to support retrenchment pruning. However, the scientific information out there on pruning mature trees and mature tree physiology most certainly does not support retrenchment pruning. 2) Congratulations on your experience. I’m also a certified arborist. And I have a doctorate in horticulture specializing in woody plant physiology. I imagine the combined experience of all the woody plant physiologists who’ve published on the topics of mature tree physiology and pruning mature trees is also fairly substantial. 3) What evidence do you have that retrenchment pruning is a “well accepted topic” in the arboricultural community? (I assume you mean practice, not topic.) If this is true, shouldn’t it be in the ISA pruning standards? 4) I’ll look forward to Davey’s published research. 5) What is a “tenured arborist?” Tenure is generally a term used in academia given to a faculty member who has been given a permanent teaching appointment. I’m a tenured professor, but I’m not a tenured arborist. 6) There are science-based, conventional methods for pruning trees, as I’m sure you know. Cutting them down or having them kill people aren’t the only alternatives. I am happy to move back to the discussion about methods of pruning mature trees. We can start with the Grabosky/Gilman studies that show the proper removal of actively growing terminal tissues results less in the controlled release of dormant buds and more in the gradual, sustainable growth of well attached preexisting shoots. They did not witness in their research any rampant, uncontrollable sprouting; which study are you referring to? Just because observations of tree responses to topping are often repeated, does not make them well established information on specified reduction. If we both understand that retrenchment or regenerative pruning is “specified reduction pruning to stimulate an inner crown”, then we can discuss the implications of the research I have cited. Do you agree with this definition, or do you prefer another? What is retrenchment pruning, what’s it got to do with tree care, and why should you care? I’m glad you asked! Dictionary definitions of ‘retrench’ include: To live at less expenses; To confine, limit or restrict; To cut off, pare away; To reinforce. The term has been used in literature and in relation to trees and their care since 1734. What do European standards say? They’ve been at this longer than we have. Germany’s ZTV standard: “3.1.9: Focus on habit and physiological requirements. 3.1.9.1, Regenerative Pruning: Trees showing significant signs of aging in the outer parts of the crown and the development of a secondary crown are to be cut back as far as necessary (crown reduction). 3.1.9.2: Crown part reduction: Individual branches are to be reduced in accordance with safety requirements and/or the surrounding tree environment. If necessary, areas surrounding the sections that have been reduced may require thinning to establish symmetry (and light penetration to inner foliage). 3.1.9.3: Crown reduction: The entire crown is to be reduced in height and/or spread, for safety or site needs. The extent of crown reduction is specifically dependent on the species and growth habit, and shall be <20%….Vigorous sprouts must be thinned and/or reduced. Cuts must be made above the old pruning wounds, avoiding damage to woundwood. As a rule, repeat every 3-5 years. Form a secondary (reiterative) crown over time." Both these standards were reviewed by dozens of peers, many of them PhD level and beyond. If there is any research showing these above-described practices are not good practices, please produce it! Retrenchment pruning was regenerating tree crowns in Europe before Columbus sailed the ocean blue in 1492, so the practice seems well-established. This webinar cites primary research by Rieland, Follett, Goodfellow, etc. demonstrating that reduction pruning of healthy trees increases tree stability, with good health and low maintenance. Please advise if anything is not clear, and I will be glad to respond. No need to get incensed! “Increasing the light intensity will boost the speed of photosynthesis.” from http://fhs-bio-wiki.pbworks.com/w/page/12145771/Factors%20effecting%20the%20rate%20of%20photosynthesis along with many other studies of tree physiology tend to debunk the myth about “photosynthetic reduction always results from pruning”. I’ve yet to understand how anyone could come to this conclusion in a way that’s supported by any plant physiology research. This is from one of the 2 articles mentioned by the OP. It is more than “philosophy with a smattering of ecological theory”. It provides specific guidance based on experience and study, and specifies extra wounding for habitat as the exception, not the rule. This should clarify the primary misconception expressed in the OP. ” This leads to an approach to restoration of trees that appear to be stressed or prone to catastrophic failure. retrenchment; stimulating rejuvenation growth within the lower portions of the canopy. be cut no lower than five times the diameter above the bolling (or point to pole origin). I talked about reduction pruning to 100s of people at ISA-PNW last week. All of the alleged very angry, incensed people who kept their lights under bushels at Orlando also stayed silent in Oregon. Maybe this alleged anger is just another myth? It sure ain’t scientific! Sometimes in life in our arrogance we humans like to over complicate things . We are so self important with our studies and research….take a walk in the woods for crying out loud and look what trees do! They will tell you what works…. Good banter though. And no I’m not saying research is bad….I have learned a lot in 30 years of applying science to the touching of trees. Thanks for getting my wheels turning…same discussion at expo this year!! Thank you Paul, I am glad to hear that the topic is still alive at Expo. I skipped Expo this year, but spoke on the same topic two years ago at Expo. There is a very stubborn adherence to antiquated concepts in pruning, like heading cuts for instance. You can see that if you take a look at the current draft of the A300 pruning standard. It May please the traditionalists who do not want to pay for revising their training materials, but itrepresents a step backwards in the evolution of pruning in North America. In August 2015 I heard “You’ll have to wait” for comments on the paper verifying that reduction pruning is sustainable and effective. Now In March 2016 we hear “You’ll have to wait” until August 2016, and travel to Texas, to receive this wisdom. Thanks but I’ll have to pass. If it takes this long to review one paper…Please be sure your search methods turn up Reiland and Follett. btw I’ve followed Lonsdale’s work for some time and this inoculation work that has you so angry and incensed is narrow and specialised, fitting few assignments and not at all indicative of his overall work. The selectivity of your searches is incredible! Angry and incensed? Not sure where those adverbs came from. Certainly not from anything I’ve said or written. Read your first post in this Energizer Bunny of a thread. Once you get beyond the oxymoronism of “dormant apical buds” this theory has been tried and failed in the field. We made some of those ‘coronet cuts’ that are a popular fad in the land of crowned royalty﻿ in our research plot last summer, and we expect the stubs will die back but still achieve the overall goal of increasing habitat for saproxylics. We’ll post pics of the results in 2019. The UK Standard says naught of extra wounding: “Retrenchment pruning is a phased form of crown reduction, which is intended to emulate the natural process whereby the crown of a declining tree retains its overall biomechanical integrity by becoming smaller through the progressive shedding of small branches and the development of the lower crown (retrenchment). I’ll be presenting on Regenerative Pruning (I avoid that other R word due to the association that we both bemoan) at the UK conference this September. I’m somewhat relieved that firearms are rarely encountered there.